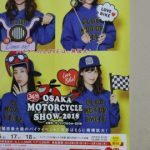 It is Osaka Motorcycle Show for three days from today. Carrying in is completed. I am sweating in the car at the rooftop car park in Building No. 6 now and are in the breakfast. 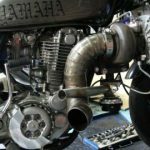 Change SR 400 to 17 inches. Assemble the spokes. After the painting of the hub is over. 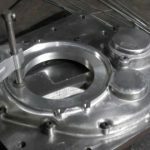 I will assemble the spokes for the 17 inch rim made by NEXXS. To be honest, I am the first time to assemble spokes.It is difficult. I assemble 5-6 times and disassemble and am completed somehow. Once the spokes are assembled, the centering will be adjusted next. When that is over, paste the tape of the OUTEX made tubeless kit and make it tubeless. But, I forgot to take the photograph.